A brilliant, gifted footballer who played his first senior match for Carlton before his 18th birthday, Keith Shea was a valuable member of Carlton’s 1932 Grand Final team, and a star for the Blues in the harsh years prior to World War II. After an all too brief stay at Princes Park, he was lured to Western Australia at the peak of his career. Shea was recruited from Bacchus Marsh as a junior prodigy. Although lightly-built, his wiry frame was deceptively strong. He was quick, beautifully balanced, very capable overhead, and kicked long off his preferred left foot. Still just 17 years old, he forced his way into the Carlton senior side half-way through the 1932 season, and only injury kept him out from that day on. Remarkably, Shea played under different captains in each of his six seasons with the Blues. In order, they were Colin Martyn (1932), Frank Gill (1933), Maurie Johnson (1934), Charlie Davey (1935), Jim Francis (1936) and Ansell Clarke (1937). Amidst the deprivations of the Great Depression - indeed, because of them - VFL football continued to draw huge crowds throughout the thirties, and players were comparatively well paid. Therefore, places in every team were highly prized and hotly contested. 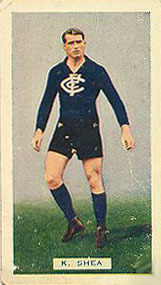 In just his eighth game for the Blues, Shea announced his arrival with a slashing performance on a half-forward flank against Richmond in the 1932 Second Semi-Final. Although the Tigers won comfortably in the end – by four goals – they couldn’t subdue the youngster in navy blue guernsey number 8. Shea’s creativity, accurate foot-passing and two opportunist goals made him a thorn in Richmond’s side all day. He was even better the following week, when Carlton thrashed arch-rivals Collingwood in the Preliminary Final, and earned themselves another tilt at Richmond for the flag. Crack full-forward ‘Soapy’ Vallence booted eleven goals, and Shea chipped in with another couple, as the Blues belted the Magpies by 75 points. On the back of that performance, Carlton went into the Grand Final confident and ready, but came up against a tenacious Richmond team that was just that bit more composed when it mattered most. In one of the great flag deciders – a test of wills, skills and courage all day – Richmond edged in front late in the last term, and won by nine points. Vallence kicked another five for the valiant losers, while Shea impressed again despite a concerted physical assault by the Tigers. Shea played finals football for the Blues again in 1933, ’34 and ’36 without progressing past the semi-final stage, and in 1934, was selected in the Victorian state team for the first time; an honour that would be repeated in 1935, ’36 and ’37. In all, Shea wore the Big V in interstate matches on ten occasions. After one of those games, WA coach Austin Robertson (Snr) described Shea’s play as ‘spell-binding’. It is not surprising then, that while playing for the Big V against WA in Perth in 1937, Shea was approached by the Subiaco Football Club with an offer that he was unable to refuse. Then, as now, fuelled by a mining boom, the WA club was on the hunt for players that could bring them a flag, and they were prepared to pay whatever it took to get them. Shea agreed to terms, as did Fitzroy’s champion Haydn Bunton – the triple Brownlow Medallist – and Geelong star Les ‘Splinter’ Hardiman. All three crossed the Nullarbor to play for the WA Maroons in 1938, and though Bunton went on to win three Sandover Medals as the Best and Fairest Player in the WA League, the ultimate glory of a Premiership eluded them. Keith Shea returned to Victoria in 1945 to spend the last year of World War II as captain-coach of Hawthorn. Aged 31, he retired as a player after that one last season, but continued on as non-playing coach. However, the Hawks were at a low ebb, and after they won just three matches in 1946, and collected another wooden spoon, Shea resigned in favour of club captain Alec Albison. Shea's last season as a player at the Hawks brought his overall games tally to 99 for 109 goals. Shea was appointed captain/coach of North Albury in 1948 and delivered their first premiership in the Oven and Murray league in that same year. Shea is a Hall of Fame member of the club and the senior best and fairest trophy is named after him. A player whose career flamed brightly yet briefly across the fabric of the Carlton Football Club, Keith Shea tragically died from complications from a burst appendix on February 27, 1951. He was just 36 years old. Keith Shea was appointed playing coach of Rupanyup for season 1947. "Mr. Keith Shea, the former Carlton and interstate footballer, died in the Albury District Hospital early on Tuesday morning, after a brief illness. He was aged 37. Coming from Bacchus Marsh, Shea first played League football for Carlton at the age of 16. He was a fast moving wing half-forward, who kicked left foot, and had a "blind turn" that tricked most of his opponents. Shea played for Carlton for six years, and he was a regular interstate player. After he left Carlton he coached Subiaco, South fremantle, Oakleigh, Hawthorn, and several country clubs, including Griffith, runners-up the the S.W.D.F.L. competition last season. Footballers and other friends will regret the passing of such a brilliant player and good sportsman. The S.W.D.F. League sent a wreath to his funeral in Albury. Narandera Argus and Riverina Advertiser 01 March 1951. The Horsham Times, 02 March 1951, published it's Keith Shea obituary. Contributors to this page: Grisdesa , Jarusa , blueycarlton , Bombasheldon , molsey , PatsFitztrick , true_blue24 and admin . Page last modified on Monday 27 of August, 2018 23:46:54 AEST by Grisdesa.